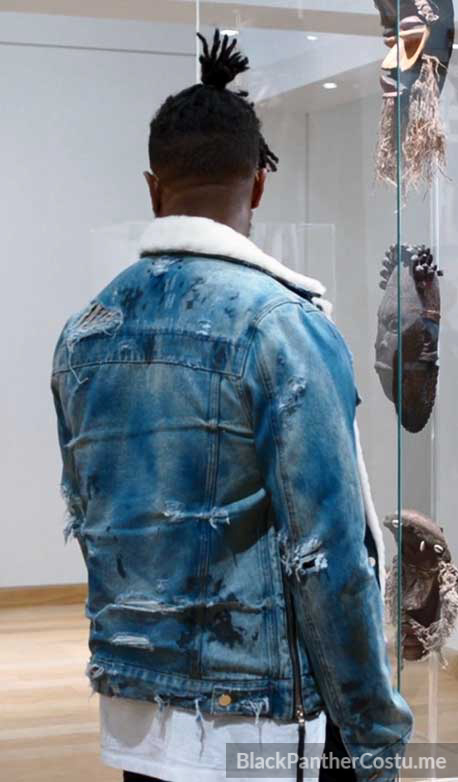 Buy a shearling denim jacket and add paint stains and distressing yourself. 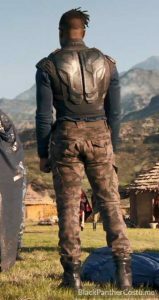 Buy drop crotch black pants. Watch this Killmonger hair tutorial. 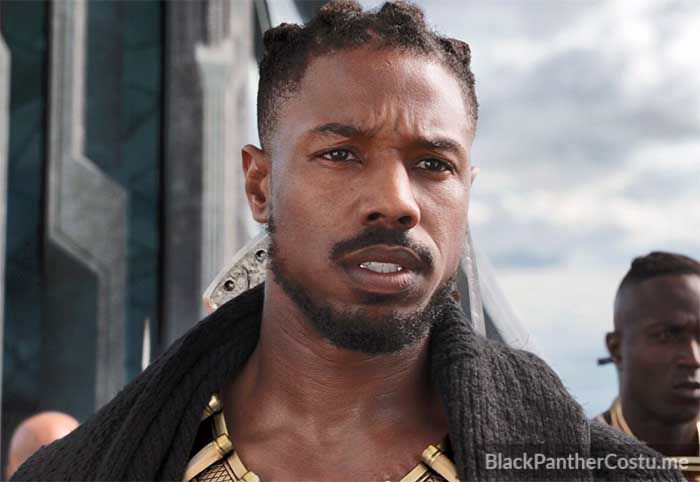 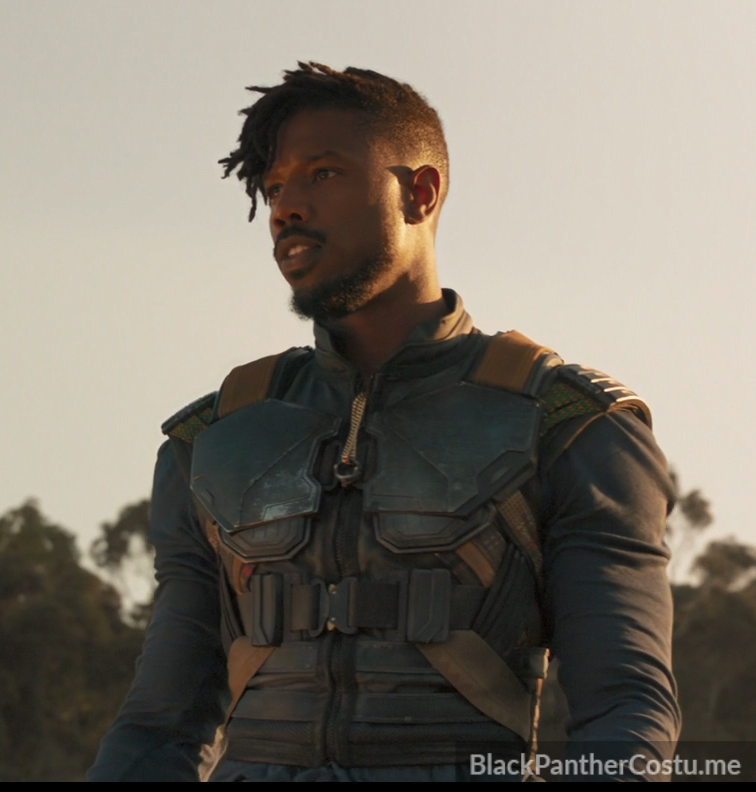 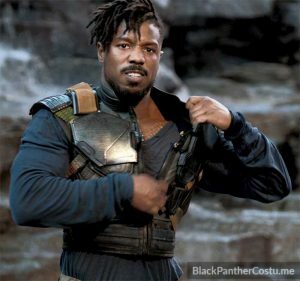 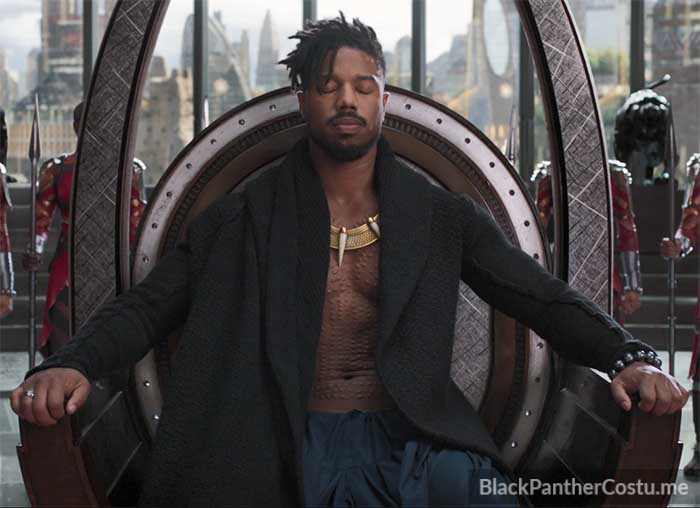 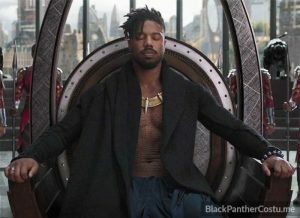 Michael B. Jordan’s “museum bae” look immediately lit the internet on fire when Black Panther’s trailer was released, but Carter says he could have been costumed very differently: In an earlier draft of the script, Jordan’s Killmonger was an anthropologist, and Carter wasn’t quite sure how to make that work. “When you think of an anthropologist, you think of a guy in a sport coat and slacks,” said Carter. 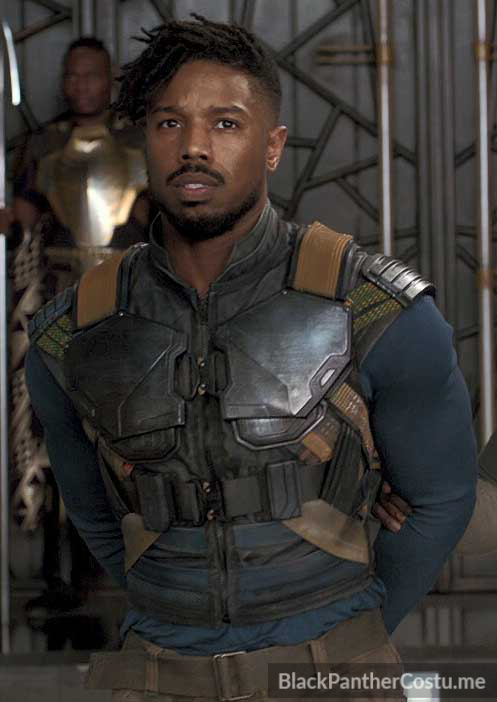 “And I was like, ‘How is that going to work on Michael B. Jordan?’ I couldn’t get my head around it. 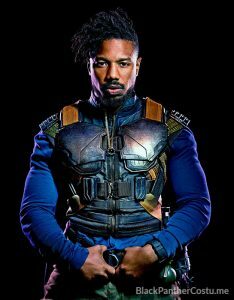 And then Ryan Coogler was like, ‘No, he’s gotta represent the urban lifestyle, urban consciousness, and be unapologetic. 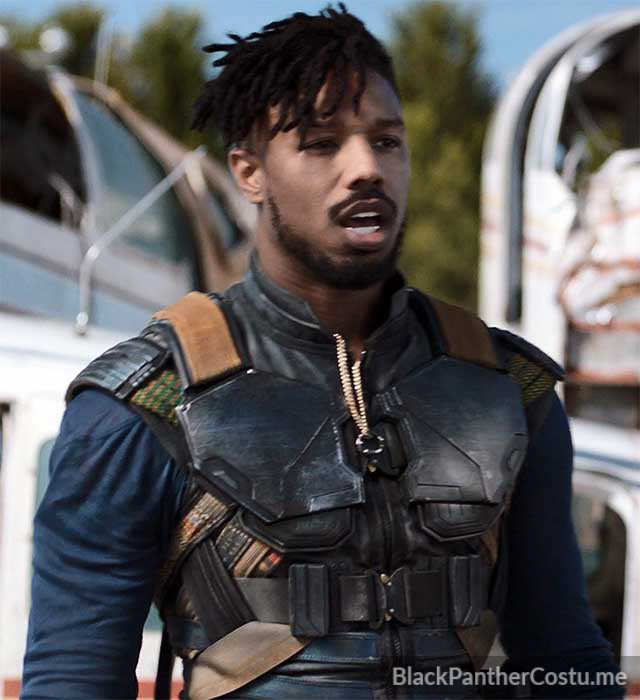 The result is a distinctive look that incorporates a shearling jean jacket, Balmain military boots, and a couple of extra touches that thrilled Carter’s director. 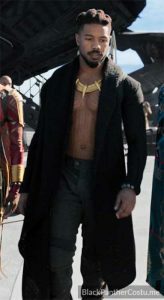 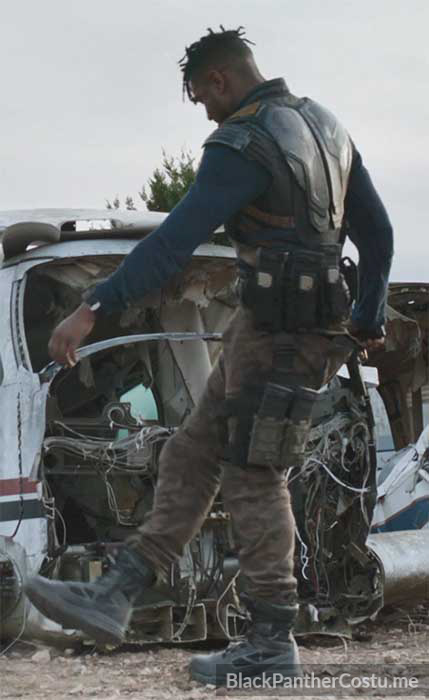 “We gave him some drop-crotch pants because Ryan Coogler loves a drop-crotch pant,” said Carter, who also added grills and glasses to the final look. “We’ve never seen Michael B. Jordan wearing eyeglasses like that! 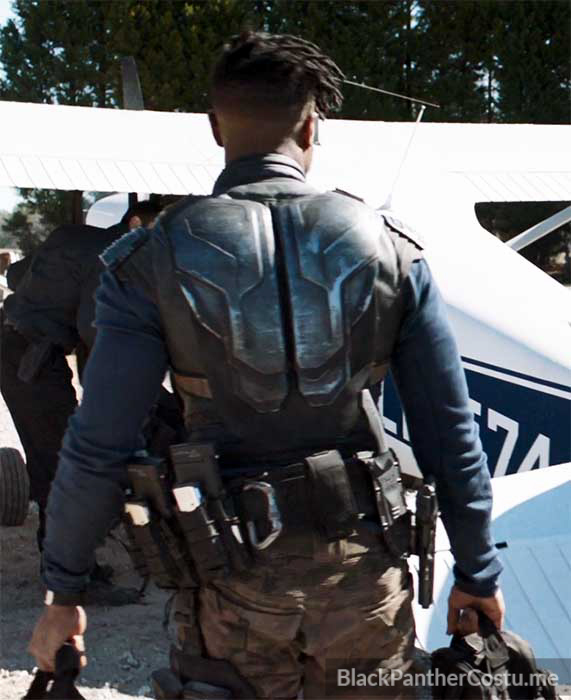 Ryan Coogler went to the moon every time he saw him in these glasses — he would just laugh. You could just see by the look on his face that he felt it was so right. Buy a long sleeve blue t-shirt. 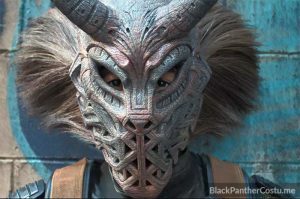 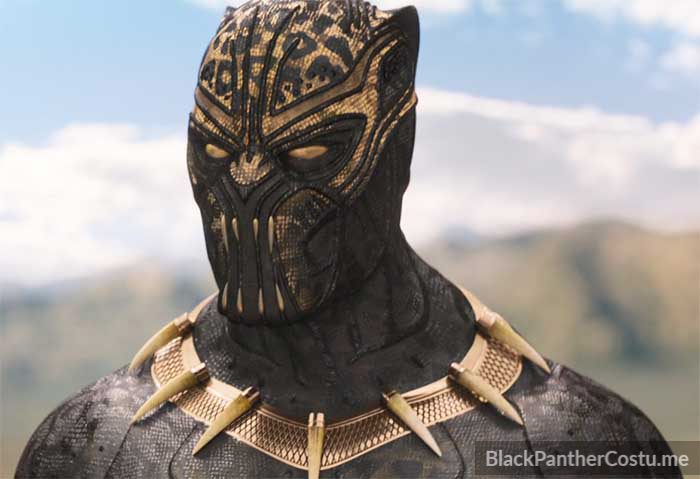 Buy a Killmonger mask replica. 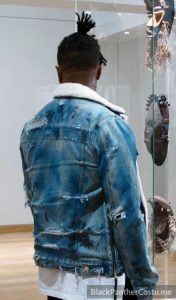 Buy skinny camo biker jeans. Erik “Killmonger” Stevens’ scars took months to create. 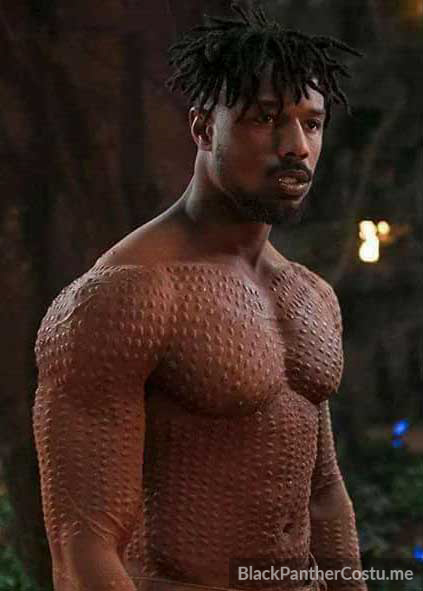 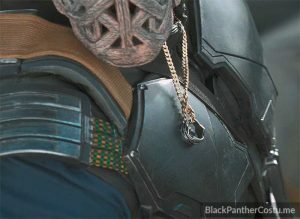 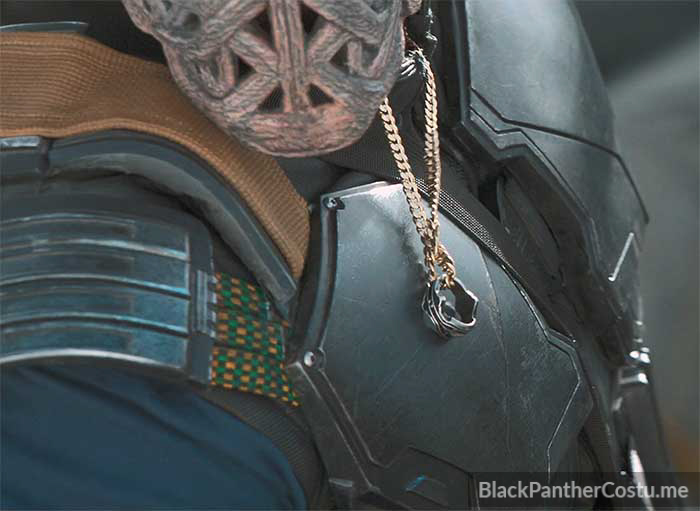 In order to achieve the marks seen on Erik “Killmonger” Stevens’ (a.k.a. 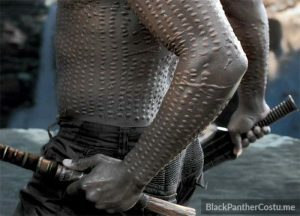 N’Jadaka) chest, the makeup crew made each hashmark individually, starting months prior to filming. 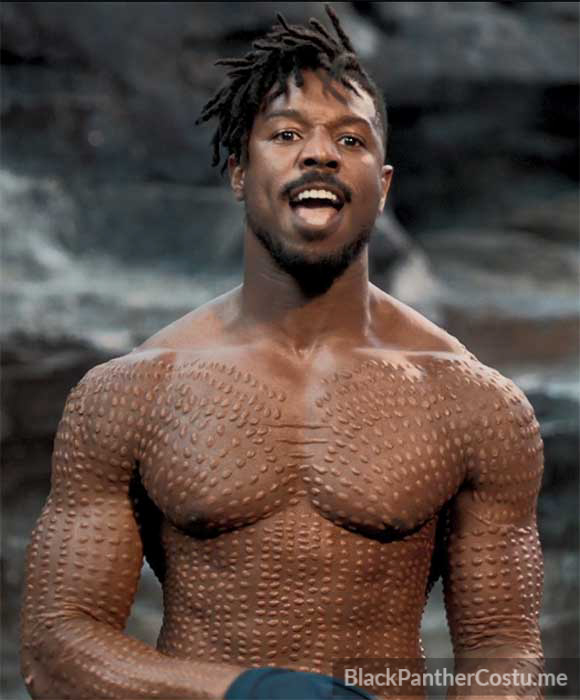 Watch a video about Michael B Jordan’s scarification makeup. 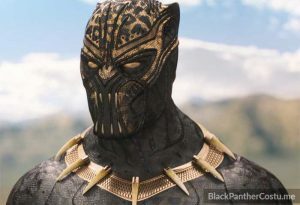 Buy some Pros-aide and watch video tutorials about Pros-Aide transfers. 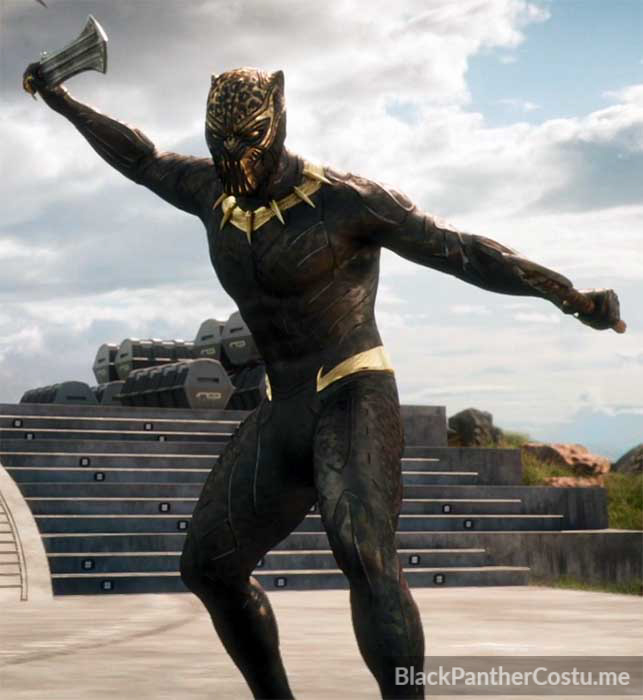 Also known as the Golden Jaguar suit. 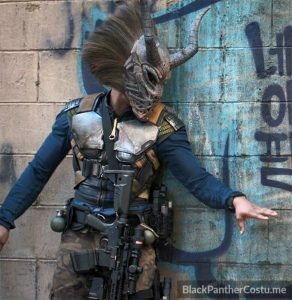 On a budget: Golden Jaguar Suit. Higher quality suit: Golden Jaguar Suit.